Tensions were high at the press conference held on January 16, 2002 in Los Angeles to formally announce the Super Welterweight fight between Oscar De La Hoya (34-2 with 27 knockouts) and Fernando Vargas (22-1 with 20 knockouts). Titled Bad Blood, the two fighters showcased why that is the proper designation. A brief shoving match occurred between the two, as the press conference got underway. The raucous crowd shouted obscenities at both fighters. Not to be left out, De La Hoya trainer Floyd Mayweather Sr. recited a poem about Vargas, and belittled Vargas for being under house arrest. Vargas� camp fired back about De La Hoya�s singing career and calling De La Hoya�s heart into question. Both fighters eventually got into the war of words with De La Hoya saying �He�s got a glass jaw; I know where to hit him�. Vargas replied �Why you crying� referring to De La Hoya�s watery eyes; implying that De La Hoya was scared. The man with the biggest smile during all the chaos was Promoter Bob Arum, because at $49.95 for the pay per view event and the profit from the gate at Mandalay Bay Resort & Casino in Las Vegas, he will sure rake in the money as these two Chicano boxers battle it out. Arum, fearing the worst, limited the press conference to the news media and those directly connected to each fighter. Experts are calling the bout a classic in the making. Vargas hopes De La Hoya does not run so he could retire him, while De La Hoya guarantees to knock Vargas down four times. At one point Floyd Mayweather Sr. said that this is the fight that Mexicans want to see because it�s between two great Mexican fighters. A pro-Vargas supporter shouts, �There�s only one true Mexican fighting�. Mayweather Sr. questions the man with �I thought a Mexican was a Mexican�. Vargas then proceeds with �The difference between this Mexican and that one (pause) this one has (expletive) balls.� The crowd erupts. Typically, fight conferences are hyped with supposed �bad� feelings between the fighters, but in this instance, it�s legit. Both fighters, even before the bout was signed, made it clear that they don�t like each other. 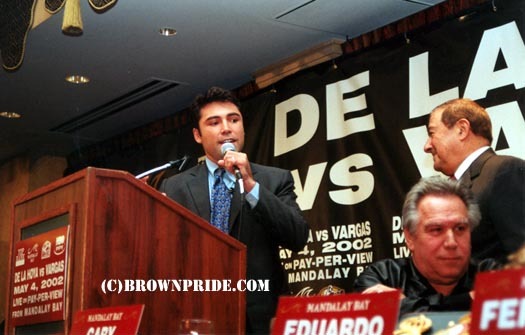 Vargas said he used to like De La Hoya until De La Hoya �disrespected� him when Vargas trained briefly with De La Hoya. De La Hoya calls Vargas a �Stalker�. The war of words will definitely continue up till moments before the bell rings and the fight begins on May 4th, 2002. The fireworks will then explode in a bout that promises to thrill the buying audience.